The Economist magazine provides an annual, slightly tongue in cheek, index of relative currency strengths known as The Big Mac index where they compare the price of the veritable Bic Mac across the world. The principle being that the ingredients are the same in each country and so the difference in prices compared to the 'official' global FX rates is an indicator of whether a currency is over or under valued. 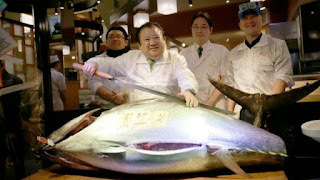 Sadly this cannot be repeated with the great bluefin tuna as their simply aren't enough left. Some 80% of global tuna consumption is claimed by the Japanese consumer and, as tastes changed in the 1960s and 70s, and fishing the fish became industrialised, the catch skyrocketed and stocks crashed, now down some 96% since records began. Although Japan reduced its catch by a reported 50% in 2014, this only related to immature fish; the big ones remaining in trouble. There are six whaling ships on the oceans but thousands of fishing boats so change will only come slowly. There is light on the horizon though. 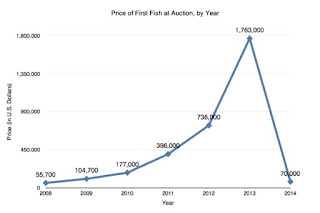 The plunge in the price of the (ceremonial) New Year's Day tuna auction from $1.7m for a fine fish in 2014 to a mere $70,000 in 2015 was a reflection of the public becoming more aware of the catastrophe and also looking at the 2014 excesses as being somewhat distasteful. 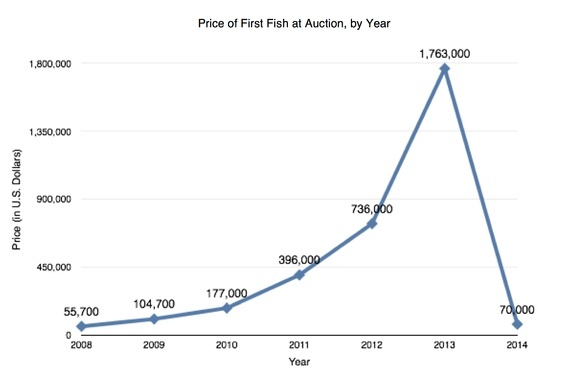 But the final fish at Tsukiji will soon be sold as the famous market is relocated across Tokyo Bay later in 2016. If you're in town for a tour, the market starts around 5.00am. Enjoy it while you can.